We have stumbled on Three Dog Night at The Hand in Hand. Gill and I are in a tender embrace as the dogs embark on a tri-partite sexual encounter (as dogs will) around our feet. In the middle of this tiny Kemptown pub, we’re being filmed, dogs and all. Huddled in the corner are the members of The Self Help Group, playing their song, The Rapture. It’s not a gig, it’s the making of their music video. Jamie and Stevie, from The Union Music Store, quickly had to find a replacement film set, and The Hand in Hand is it. As we go through our dance routine for the film, regulars walk past the camera, completely unfazed, to the bar (three steps) and perch on a stool, with or without dog. We have already been filmed doing our sequence in eighteen situations: in a misty field (cold); in the window of a charity shop; on the rock promontory at Rottingdean (slightly scary, colder); at the checkout in Asda (the security guard smiled and looked away); in the glass lift in Churchill Square mall, beside a large man in a very large wheelchair; on a Brighton rooftop (really cold)… Passers-by ignore us (probably thinking, well, this is Brighton) until finally a woman eating a pie asks us if we’re getting married. Now in The Hand in Hand, we’ve finished the shooting, the band put their instruments away, and I can finish my pint of Dark Star Darkness. 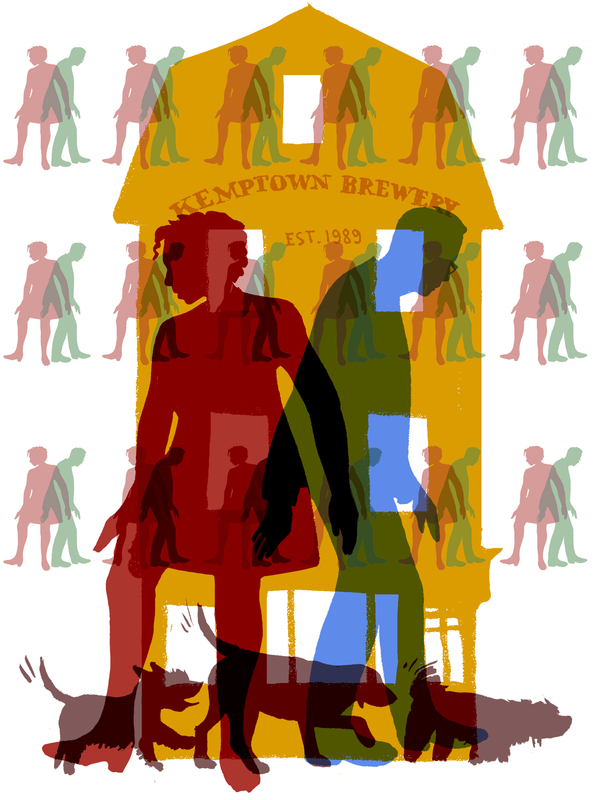 A lovely pub, and it’s the Kemptown Brewery too. And the music – acoustic-based, sweet songs, with the most gorgeous harmonies. On The Self Help Group’s Facebook page, they describe themselves as a ‘Brighton band making pretty music about mostly miserable stuff’. Their album, Not Waving But Drowning, is out on the Union Music Store label, and their next gig is at The Brunswick, Hove on the 31st May. Enough plugging. Get off, dogs!